The UN Office for the Coordination of Humanitarian Affairs (OCHA) said more than 80,000 Nigerians have been displaced due to ongoing violence in the North-East since November, 2018. The UN relief agency said that the figure was in addition to the two million people already displaced by violence, or forced across Nigeria's borders as refugees. OCHA said in 2018, relief organisations had estimated that 7.7 million people required urgent life-saving assistance. OCHA said, however, a recent upsurge in clashes between non-state armed groups and the state security forces was forcing UN agencies and their partners to reassess the needs on the ground. The UN agency said a 90-day plan was in the works to ratchet up the response, especially across the worst-affected state of Borno, to meet the immediate needs of an estimated 312,000 men, women and children. Since 2009, the North East of the country has been in the grip of a civil conflict triggered by armed opposition groups, which has now spilled over borders across the whole Lake Chad region. This has resulted in widespread displacement, violations of international humanitarian and human rights law, and protection risks for increasing numbers of civilians, which has added up to one of the world's worst humanitarian crises. 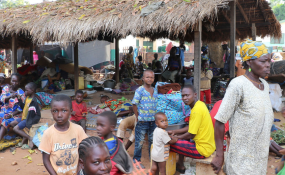 "In addition to the 1.8 million displaced within Nigeria as a result of the conflict, the violence has led many families to flee over the border into neighbouring Chad, Cameroon and Niger. "To date, about 200,000 people are estimated to be Nigerian refugees or asylum seekers, living in those countries," the UN agency said. The UN High Commission for Refugees (UNHCR), has raised the alarm over a recent new influx of Nigerian asylum seekers and refugees in Chad. "Since 26 December, when the town of Baga on the Nigerian side of the Lake Chad, was attacked by a non-state armed group, around 6,000 have been forced on the run. "Many of them paddled for three hours across the water to arrive in the lakeside Chadian village of Ngouboua, some 20 kilometres from the Nigerian border," the UN refugee agency said. UNHCR and the Chadian authorities are carrying out registration and pre-screening of new arrivals to evaluate their needs. It said an overwhelming majority of the new arrivals are women and children and, according to initial information, about 55 per cent of them are minors. The UN urged all parties to the conflict to protect civilians as well as civilian construction and infrastructure, and to uphold international human rights and humanitarian laws.